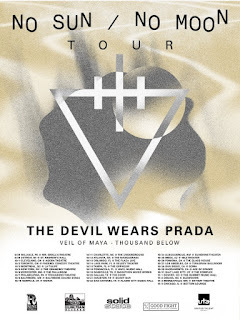 The Devil Wears Prada will return to the road this fall on a headline tour, dubbed "No Sun / No Moon." The tour will feature support from Veil of Maya and Thousand Below, with a special guest to be announced at a later date. The tour launches on September 29 in Millvale, PA and runs through November 4 in Chicago. As an added bonus that is sure to delight fans, all tour attendees will have the chance to pick up a free download card for the No Sun / No Moon documentary at the band's merch table during the show. The documentary chronicles both the writing and recording process for Transit Blues [Rise Records]. It is an intimate look into the band's most recent album and it's one that invites fans into the band's creative orbit. "I could not be more excited for the No Sun / No Moon documentary release," says singer Mike Hranica. "Versus what we've done in the past, there's no comparison. We've always felt there's been drastic room for improvement, and what Quinn Brabender came up with met our expectations." The VIP ticket bundle is limited to 25 fans per show and includes a general admission ticket, Q+A session, a photo opp, the No Sun / No Moon documentary, Transit Blues Digital Album Download, Transit Blues Digital Photobook, a hand-numbered screen printed poster, exclusive hockey puck, and exclusive slipmat. VIP tickets go on sale on Tuesday, June 27 at 10 a.m. ET. General on-sales are Friday, June 30 at 10 a.m. ET.